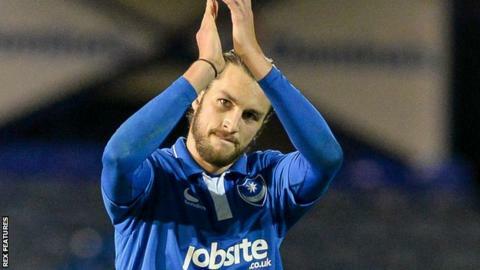 Portsmouth central defender Christian Burgess is set to be out for around a month with an ankle injury. The 24-year-old had played every minute in League Two so far this season before he was forced off in the second half of Saturday's match against Hartlepool. His injury leaves manager Paul Cook without a recognised centre back as cover for Matt Clarke and Adam Webster. "We might have to mix and match a bit if there's another injury in the next month," Cook told BBC Radio Solent. "Christian is a smashing lad, he'll be missed around the dressing room as anyone is when they're ruled out through injury. "At the moment, we'll keep going and we'll have to manage as best we can until then." Portsmouth face League Two leaders Northampton Town at Sixfields on Saturday before Christmas fixtures away at Leyton Orient followed by home games against Luton and Crawley. "This period of five games up until we face Ipswich away in the FA Cup, we've set ourselves a target to get as many points out of 15 as we can," Cook added. "We started well against Hartlepool and we're going for as many as possible."